Boyer, who has three times as many Hall-of-Fame points as his closest rival, was in top form this past week in Ohio, winning the Two-Gun with a very strong performance. This was a tough field, with over 200 seasoned shooters including many talented foreigners. Finishing second in the Two-Gun was Jeff Summers (0.2075), followed by Christian Dippolito (0.2200). Summers also won the 3-Gun (0.2408), which includes the Unlimited (Railgun) Class. “Actually, that is what 3/16 all WEEK long looks like…” — Geo.Ul. “As amazing as an 0.188 something Grand Agg is, having shot it at the [challenging] Kelbly’s range is even more so. Tough place to shoot small. Awesome job!” — Tim S.
CLICK Image for Top 10 Equipment list, 10.5-lb Class. May is Super Shoot Time at the Kelbly’s Rifle Range in North Lawrence, Ohio. 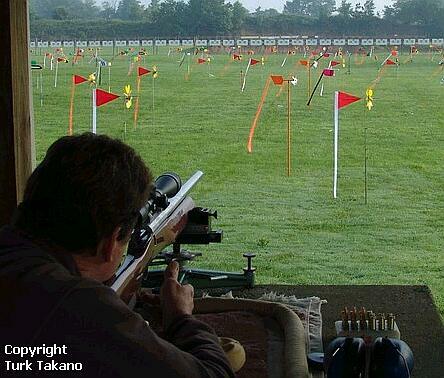 This annual event, held May 21-26 this year, draws some of the best 100-yard and 200-yard benchrest shooters in the world. Recent Super Shoots have drawn 200+ competitors from the USA and more than a dozen other countries (about 15% of the competitors come from overseas). Share the post "Tony Boyer Wins Kelbly’s Super Shoot Two-Gun Title"
Ready for the Super Shoot? The 41st Annual Firearms Industry Super Shoot will be held on May 22-25, 2013, at Kelbly’s Rifle Range in North Lawrence, Ohio. This annual event draws some of the best 100-yard and 200-yard benchrest shooters in the world. Last year’s Super Shoot had almost 300 competitors from the USA and 14 other countries (about 15% of the competitors come from overseas). The Super Shoot begins with the Light Varmint Class, for guns that weigh 10.5 lbs or less, and consists of a Warm-Up match and five Registered Matches at 100 yards. Shooters are assigned to one of at least six relays and rotate through 12 benches between each of the registered matches. The rotation ensures each shooter faces various wind conditions found at different parts of the range. Competitors can fire an unlimited amount of sighter shots into the sighter target square. The shooters use these sighters to check changes in wind conditions and determine the amount of hold-off, if necessary. Once the match starts and the “Commence Fire” command is given, shooters have seven minutes to fire five shots into the record target square. These five shots comprise their “group” score for the match. The groups are gauged using a target measuring device with a magnifier and measures the two outermost shots in the group from center point to center point. This group size is the shooter’s score for that match. The laymen’s way to calculate group size is to measure outside edge to outside edge and subtract the bullet diameter. Both procedures achieve roughly the same results. The group sizes for the five record matches comprise their 100 yard Light Varmint Aggregate. Obviously, the smallest aggregate wins. The second day repeats the process, only competitors are shooting the Heavy Varmint Class rifles, weighing up to 13.5 lbs, at 100 yards. On the third day, the targets are moved to 200 yards and the Heavy Varmint Class is shot at that yardage. The reason for staying with the Heavy Varmint Class is that shooters who switch to heavier barrels can leave them on after shooting 100 yards. On Saturday, the final day of the match, the shooters compete with the Light Varmint guns at 200 yards. There are winners for each yardage and gun: Light Varmint 100, Light Varmint 200, Heavy Varmint 100, and Heavy Varmint 200. There are also winners for each gun with the two yardages combined. The grand champion of the shoot is the Two-Gun Champion who has the lowest overall group aggregate for the four days of shooting. For more information, email jim[at]kelbly.com or call (330) 683-4674. You can register onsite (at the Kelbly’s range) or CLICK HERE for 2013 Super Shoot Registration Form. NOTE: After May 10, 2013 registration fees are $130 per gun — no exceptions. Share the post "Firearms Industry Super Shoot Set for May 22-25"
We previously reported that Texan Gene Bukys won the Two-Gun Championship at the 39th Firearms Industry Super Shoot (FISS) held at Kelbly’s Range in North Lawrence, Ohio. This was a notable performance, as Bukys started out Friday with a 1.249 LV group at 200 yards and came back (in tough weather conditions) to win the Two-Gun. Bukys’ Aggregate for 100/200 yards in both the 10.5-lb (Light Varmint) and 13.5-lb class was .2240″. Larry Costa (Florida), the 2008 Two-Gun Champion, finished a close second with a 0.2247″ Two-Gun (all yardage) Agg, while Wayne Campbell (Virginia) finished 3rd with a 0.2302″ Two-Gun (all yardage) Agg. Costa also had the best 10.5-lb class 100/200 Agg, at 0.2173, while Bukys had the best 13.5-lb class 100/200 Agg, at 0.1902. Bukys, Costa, and Campbell will all be on the USA team at the 2011 World Benchrest Championships held in France this summer. Notably, Berger Bullets Master Bulletsmith Eric Stecker shot the smallest group in the entire competition, a stunning 0.054″ in the 10.5-lb class at 100 yards. Yes that’s 0.054 for FIVE rounds — it appears those Berger guys do know how to make some pretty good projectiles. Andy Shifflett had an 0.084″ small group in the HV class. In linked PDF files below, you’ll find complete results for the 2011 Super Shoot. Considered by many to be the major 100/200 yard benchrest event in the world, the Super Shoot was held May 25th through 28th. Over 250 of the top benchrest shooters from 12 countries competed in this four day, two-gun event. Conditions were tough with constantly changing wind conditions in addition to thunderstorms, intermittent rain/hail and the inevitable mud. Share the post "2011 Kelbly’s Super Shoot — Complete Results"
Further Super Shoot Results will be provided as soon as available. Photo courtesy James Mock. Share the post "Gene Bukys Wins 2011 Super Shoot"
Here is late-breaking news from the Firearms Industry Super Shoot at the Kelbly’s Range in North Lawrence, Ohio. Canadian George Carter has won the 2010 overall two-gun Super Shoot Championship. Together with his lovely wife Vera, the Carters also won the husband and wife event, and Vera placed first in the woman’s 13.5-lb (Heavy Varmint) competition. We are told that Gene Bukys placed second overall by a very narrow margin, and it has been reported that Bart Sauter (of Bart’s Bullets), finished third. According to Bill Gammon, who took the photos below, the match was well-attended, with shooters from many different countries including: Australia, Austria, Belgium, Canada, Finland, France, Germany, Holland, Indonesia, Italy, Luxembourg, New Zealand, Norway, Sweden, UK, and the USA. Kudos to the Carters, and congratulations to all who participated in this year’s Super Shoot. View more photos on the Benchrest in Canada Forum. Attached below are the complete results of the 2010 Super Shoot in various file formats. The summaries provide event by event rankings for the top shooters. The comprehensive files list all match results (and aggs), shooter by shooter, in alphabetical order. Sorry, no equipment lists are available yet. In the 10.5-lb (LV) class the Grand Agg Top Five were: 1. Steve Theye 0.2161; 2. Gene Bukys 0.2225; 3. Bob Scarbrough, JR. 0.2267; 4. Andy Shifflet 0.2283; 5. Larry Costa 0.2289. Bart Sauter had the low 100-yard LV Agg at 0.1874, while Steve Theye had the best 200-yard LV Agg at 0.1964. Small Group was shot by Eddie Harris, an 0.077 at 100 yards. For the 13.5-lb (HV) class, the Grand Agg Top Five were: 1. George Carter 0.2176; 2. Bart Sauter 0.2242; 3. Gene Bukys 0.2261; 4. Dave Bruno 0.2315; 5. Tim Humphreys 0.2322 Smiley Hensley won the 100-yard HV Agg, with an 0.1774, while Jim Carmichael had the best HV 200-yard Agg, an 0.2161. Small Group was an 0.087 shot by Bob Hammack at 100 yards. Share the post "Canadian George Carter Wins Super Shoot — Full Results"
Greetings from Sunny Ohio. Normally calling the weather “sunny” in North Lawrence, Ohio is sarcasm. During the last two days of the Super Shoot the word “sunny” is the best description of what shooters faced from Mother Nature. Day 3 provided some cloud cover in the morning which lasted for a while but was soon turned into bright and clear skies. High 40° temperatures and mid 80° highs was more of the same for those who were expecting the rains to come eventually. In case you haven’t heard yet, Tony Boyer was the big winner at this 37th Super Shoot. Congratulations to Tony Boyer for another impressive performance. Tony sets the bar for benchrest excellence. Once the 200-yard stage was over the Heavy Varmint Grand Agg was determined. See if you don’t spot a few of those who did well at 200 yards in the following list of the top 5 of the Heavy Varmint Grand Agg. By the time the last day started the shooters were commenting on how the Super Shoot had not seen four clear, dry days in a row since 1995. There is little question that this year’s Super Shoot provided some of the best weather conditions we’ve had for some time. Temperatures were similar to previous days and winds continued to be tricky but not extreme. The Light Varmint 200-yard stage gave us all a chance to break out the 10.5-lb guns again after two days of getting spoiled with the 13.5-pounders. Most folks were ready to shoot at 200 yards but a few shot flags indicated that some BR shooters still are working on which way to turn the knobs when the distance increases. The following is a list of the top 5 shooters who were on top of their adjustments for the Light Varmint 200-yard stage. The completion of this final stage provided the Super Shoot with not only a Light Varmint Grand Agg Champion but also a Two-Gun Champion. For those who have been keeping track of the top five in the lists so far some of the names you see below will be no surprise. Here are the top five in the Light Varmint Grand Agg. Another thought crosses my mind as I look at these scores. I hear many times how shooters who do not compete in Benchrest matches say that their rifles are capable of “1/4 MOA… all day long”. Take a look at these scores you will see that 1/4 MOA accuracy “all day long” would put you in the top three of the largest and (arguably) most competitive BR match in the country. Share the post "Stecker Reports from 2009 Super Shoot: Final Results"
5/23 Update: Tony Boyer Won the HV Grand Agg (0.1997) and 200-yard Agg. Tony finished 2nd in 100-yard HV Agg, behind Gene Bukys. Greetings from (or near) North Lawrence, OH and home of the Firearms Industry Super Shoot. Benchrest shooters from all over the globe are here to participate in this highly anticipated event. The Super Shoot is the largest BR match in the world. Opening Ceremonies started at 8:30 am Wednesday morning. Hall of Fame shooter Allie Euber was on hand to offer words of prayer for the event, shooters, our families and those in BR who we’ve lost over the year. Allie also offered some gracious comments about one of the PPC inventors, Ferris Pindell, who was able to be here and visit all his many friends. The Super Shoot is ripe with tradition and most things are as they have been for some time. One exception is that long-time Range Master Jim Kelbly has been replaced by his son Ian Kelbly. After Ian called several matches I mentioned to Jim that if he lets Ian keep this up then Jim would be out of a job. He smiled and said “I sure hope so.” Ian is doing a fantastic job running the match. Wednesday greeted shooters with 45° temperatures which quickly warmed in Sunny Ohio to the mid 80s. Winds were present and shifty as they tend to be but not too much to be unpleasant but definitely enough to give most shooters fits. The folks listed below handled these winds and their rifle well and are the top five for the Light Varmint 100-yard stage. The record for the Light Varmint 100-yard Agg was set in 1999 by Bill Forrester at .1706. Bill’s record was safe but the 5-shot small group record of .046 set by Mike Walker in 1994 was seriously threatened by Bill Goad with a small group for the day of .048. Many shooters here would say Thursday was a tough day and they are glad that the 100-yard stages are behind them. Friday the 22nd starts with the 200-yard Heavy Varmint where some 300+ shooters will try as best they can to rise to the top of the list for the HV Grand Agg win. More to come…. Photo of Borden Rimrock Benchrest Rifle courtesy Borden Rifles. Share the post "Stecker Reports from 2009 Super Shoot"